I have no idea what I’ve been reading here, but I kind of liked it. This book is about a lot of things, it’s a SF, but it’s more about fame, social media and the human nature. In a way it works with the previous book I’ve read, as it shows humanity degrading at times, in a different way but with the same results. I’ll start with the SF element. We have the Carls and the slow-paced dementia surrounding them. I’ll let you know from the beginning that the Wikipedia thingy made my eyes do a quick 360°, but the dream scape was interesting and I would definitely like to know more about the Carl(s). I have plenty of questions left ( (view spoiler) why April and what about the aliens ?) and I will only forgive the author if he intends to write a sequel, because the “inception style” sort of ending can only work this far in his favour. 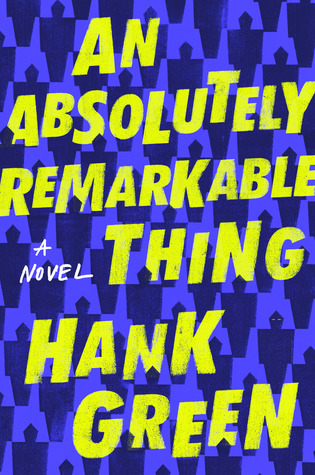 I need answers – as the 8 billion people in his book deserve to have them, and this book sounds cool as part of a series, but as a standalone it feels incomplete. 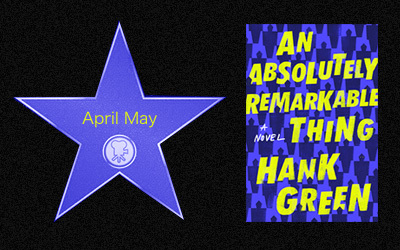 Because April’s readers know more about this story than Hank’s readers do, so it gets to be a bit frustrating when turning the last page of the book as you realise that you’re the one left out. Social media and fame go hand in hand. Even without the science fiction robot element, this side of the book will be the one driving the storyline forward. After all, it doesn’t matter what the problem is, or how a person gets to the top of the (online) pyramid, it’s what they do with that fame and how people act in their behalf that matters – and people went a bit crazy with and against April. The transition was slow, but it affected April more and more. First she was a girl, than she was a girl with a brand and in the end she became what she was preaching. But this is the world we live in today, the one in which people measure their happiness in likes and shares and viewers and such. It’s not the best of worlds, but it’s what we have, so there’s no wonder how believable it was to see April trapped in her own bubble of fame from the moment her numbers first skyrocketed. And even more so, how much she worked to keep the trajectory throughout the entire book. I disliked April, but it’s ok because she didn’t seem to like herself much either. Her story though was powerful – painfully slow at times, but it worked as I could understand her (and her mistakes, her way of reasoning) better. She was an average NY girl struggling in a world too big for her, until her ego became bigger than the world itself and that’s when trouble started. She started hiding information, she started using the people around her, she was reckless and then even more reckless and I wanted to shake her or just take her phone away for a few minutes and make her think, really think. There was also this particular detail rubbing me the wrong way… The book was supposed to explore different types of relationships, with the main character being bisexual, but it felt a bit all over the place. The idea was good, the execution not so much, as it felt like the author tried too much to sound casual while not sounding casual at all. On the other hand, it’s not bad that there was close to no romance, because the book had so much going that it could have overwhelmed the reader with unnecessary drama. This book packed more than it could handle, but it was entertaining and mysterious, and those things worked in its favour. The beginning was slow and April’s voice made me care little for the overall characters, but I couldn’t wait to uncover the mystery side by side with her. The ending leaves me with a lot of questions unanswered including some of the biggest. So to say that I can’t wait for a potential sequel… there’s not need for that. (view spoiler) Otherwise I just have no idea what the point of the book actually was – and I am not sure that’s a good thing. Grabby hands!